I've been using Harbor Freight Red via ASBB method. My coats seem OK, but on close inspection you can see through it a little bit. I measure the diameter after coating and dang if I can tell any increase. Does it make sense for the coating to be less than a mil? I don't size before coating. So I take a bare bullet and reserve it from the rest. Then I powder coat, and then measure a powder coated bullet against a bare bullet. Maybe I just stink at taking measurements because I can take the same, unsized bullet and measure it several times and get diameters that vary a few thousandths. I figure this is just slightly out-of-round. But when there is 3 mil variation within the same bullet, it is kinda tough to pick out an increase of 1 mil. I guess it doesn't matter much since I get fair performance at the range, I just wonder if other people notice that HF-Red is thinner than other powders when using the ASBB method. 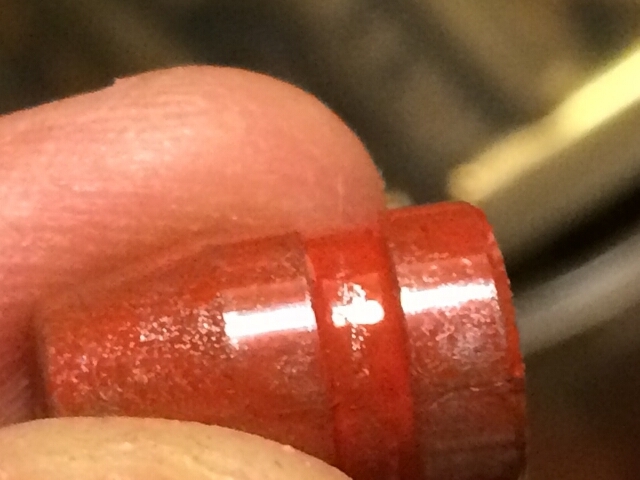 With a nice smooth unsized coat of HF red, I've measured about 1 mils thickness or 0.002" increase in diameter of the bullet. In terms of uneven coats, I've deliberately tried powder coating on a high humidity day to get "poor coverage" with HF red. This was coated on hot humid day after a rainstorm. So a single uniform coat, even if it looks speckled like this, will protect the bullet and work fine. Last edited by rsrocket1; 02-07-2019 at 09:44 AM. I have not noticed it being thinner than others when tumbled. If anything, I believe it's a thicker coat, just not as smooth, probably due to being a larger particle size. I live in the Gulf Coast I have tried HF powder. I also found I couldn't get a uniform coating and without bare spots unless I did a double coat. So why double my time & effort just top save a couple of bucks on powder. A pound of quality powder will coat thousands of bullets and maybe for some fooling with HF is worth it, but not for me. Epoxy PC is different than epoxy PAINT! Paint hardener creates low temp heat to force the crosslink which does take much longer to cure. PC uses external heat. HF red is the powder I started with and I’m glad I tried it. I use smokes powder now, but wouldn’t have considered trying powder coat at all if it weren’t for the availability of the cheap powder and bb’s. I figured a free toaster oven and $20 worth of stuff wasn’t so much to loose, but it actually worked! I got my 9mm to stop leading, by bumping up the diameter just enough with HF red. Smokes powder does work easier. Not worth the trouble to try and get full coverage with HF in my opinion. I mix the HF red 50/50 with Smoke's powder- the combination gives great coverage and interesting colors. I size after PC but give then a spritz of Hornady one-shot to help with the sizing thru the lee dies. You do realize the powders can have different bases, like polyester, polyurethane, epoxy, etc. The results of mixing can be a coating that does not have the properties of either powder and not in a good way. Back when I first started PC, now 7 years, I had a little powder left over from two different colors, so I said why not mix? Well the why not I found was the resulting powder after full cure looked great, but could be scrapped off my bullets. I had lost the hardness so essential for the polymer jacket and a total waste of my efforts and expense. Since then I have conferred with a lot of professionals in the PC industry, including a physicist and chemist I have learned a lot more than I knew back then. I admit I use the mixed powder from my over-spray to coat things like storage cans, yard tools, etc. but I would never mix powders for my bullets or anything critical because I am not a polymer chemist. With literately thousands of colors of powder available I can get any color I want and know it is not going to have problems. Just my advice, but it is your hobby and your gun barrels so whatever you are comfortable with. I think as long as you get good results, with no leading, that’s the ultimate goal your fine. The measuring, of a coating is a bit difficult. If we use a caliper, not the best tool, but it’s faster and cheaper. When we use a micrometer, a good one that measures out further you will get better picture. Mark a boolit some way, after casting, and cooling. Measure in same place,doesn’t mater where, or if its out of shape. As long as you do it the same you should see an increase in size. Mine measure 1-2 mil larger with HF red. I mix the HF red 50/50 with Smoke's powder- the combination gives great coverage and interesting colors. I size after PC. I do the same. Mixing a good PC with HF red gives some interesting results. 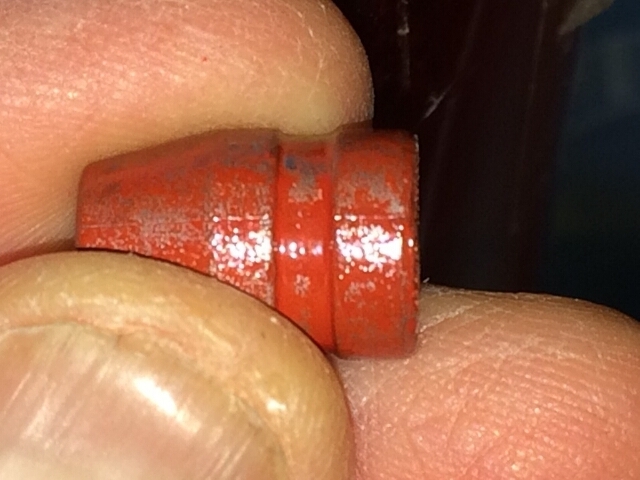 Over the last two days I’ve cast about 600 200gr .45s swc boolits, pc’ed them with HF red and sized them to .451. I’ve used the HF in the past but started having issues with it not sticking so I started all over again from scratch using the shake and bake method. They did better and looked redder before baking. It’s a thin coat but I cant cut it with my fingernail and no flaking so it might be ok. Would like them to be redder but I’m not doing a second coat. I air cooled the boolits after they were cast but quenched them in water when they came out of my convection oven. Is there a secret to get one coat good coverage with HF red doing a shake and bake? Not interested in spraying. Here’s what they look like, not pretty but as long as they don’t lead up my bbls I’m happy. Last edited by Baltimoreed; 03-01-2019 at 11:32 AM. Does warming bullets to 120 degrees or so improve the sticking of HF red? I think the pre-warm helps. It seems that it can be overdone though. It appears that if the PC sticks too thick the coating gets globby and uneven.